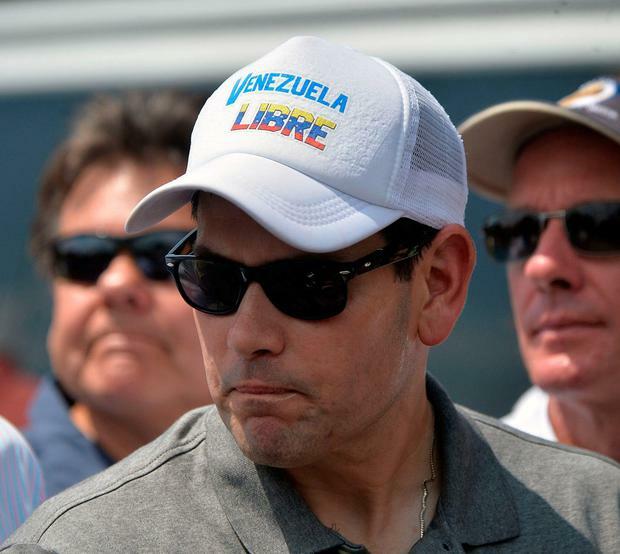 A US delegation including Senator Marco Rubio visited the Colombian border city of Cucuta yesterday, where humanitarian aid is being stockpiled for planned delivery to economically crippled Venezuela next week. While Venezuelan President Nicolás Maduro is refusing to allow in the food, medicine and other supplies, opposition leader and self-declared president Juan Guaidó has vowed to move hundreds of tonnes of the aid into the country on February 23. Mr Guaidó, who argues Mr Maduro's 2018 re-election was a sham, invoked constitutional provisions to declare himself the country's leader last month. Most Western countries and many of Venezuela's neighbours have recognised Mr Guaidó as the legitimate head of state, but Mr Maduro retains the backing of Russia and China and control of Venezuelan state institutions including the military. Mr Guaidó has said he will announce details of how he plans to get the aid into the country from Colombia, Brazil and Curaçao today, despite Mr Máduro's opposition. The February 23 deadline sets the stage for a showdown with Mr Maduro, who has said the aid is not needed. Mr Maduro calls the aid a US-orchestrated show and denies any crisis despite many Venezuelans' scant access to food and medicine. It is unclear whether the military will allow aid to cross the border. Mr Rubio of Florida is considered to have played a major role in convincing US President Donald Trump, a fellow Republican, to ratchet up pressure on Mr Maduro. The senator has long been a harsh critic of the Venezuelan leader, who he regularly refers to as a dictator on social media, and has urged support for Venezuela's opposition. Standing near a pedestrian bridge on the border between the two countries as hundreds of anti-Maduro protesters chanted and waved flags, Mr Rubio said the United States and the world would not abandon Venezuelans. "One thing is to see human suffering, another is to see it up close and personal and to meet the people and hear their stories," he said. "What is happening in Venezuela is a man-made crisis of epic proportions. A criminal regime that is willing to starve and kill its own people before it gives up power." The delegation, including Carlos Trujillo, the US ambassador to the Organisation of American States and US Representative Mario Díaz-Balart of Florida, visited tents providing medical care to migrants and the warehouse where aid is being stored. Meanwhile, Russian lender Gazprombank has decided to freeze the accounts of Venezuelan state oil company PDVSA and halted transactions with the firm to reduce the risk of the bank falling under US sanctions, a Gazprombank source said yesterday. While many foreign firms have been cutting their exposure to PDVSA since the sanctions were imposed, the fact a lender closely aligned with the Russian state is following suit is significant because the Kremlin has been among Mr Maduro's staunchest supporters. "PDVSA's accounts are currently frozen. As you'll understand, operations cannot be carried out," the source said. PDVSA branded the story as "fake news" on its Twitter account in capital red letters, but did not reply to a request for comment. Reuters reported this month that PDVSA was telling customers of its joint ventures to deposit oil sales proceeds in its Gazprombank accounts, according to sources.